Durban flights booked with us qualify to earn our world-first exclusive travel vouchers. Simply email a write-up of your flight to Durban to cheapflights@southafrica.to & we'll send you flight discount vouchers. The Mediterranean Shipping Company offers a number of cruises from Durban on board the MSC Sinfonia and MSC Opera cruise ships. Compare Durban accommodation prices to get the right combination of quality & price. If you'd like a spot close to the airport, we recommend staying at De Charmoy Estate Guest House (6km from the airport) or La-Peng Guest House (4km from the airport). "The first condition of understanding a foreign country is to smell it" said Rudyard Kipling, and after your flight to Durban lands, your nostrils will fill with the fierce smell of a Durban currie and the salty air of the Indian ocean. The good news is that Durban Airport, although a number of new international flights have been added this year, remains quiet. International arrivals have however increased by 4% this June with no increase in regional flights and a 13% increase in domestic flights. If you have to be on time, FlySafair has the best track record arriving on time about 98% of the time this December. 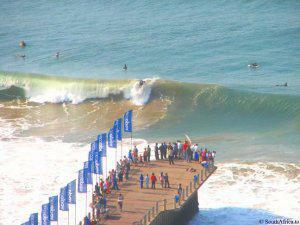 Durban's coast is almost as popular as its curry, with warm water lapping the coast line. 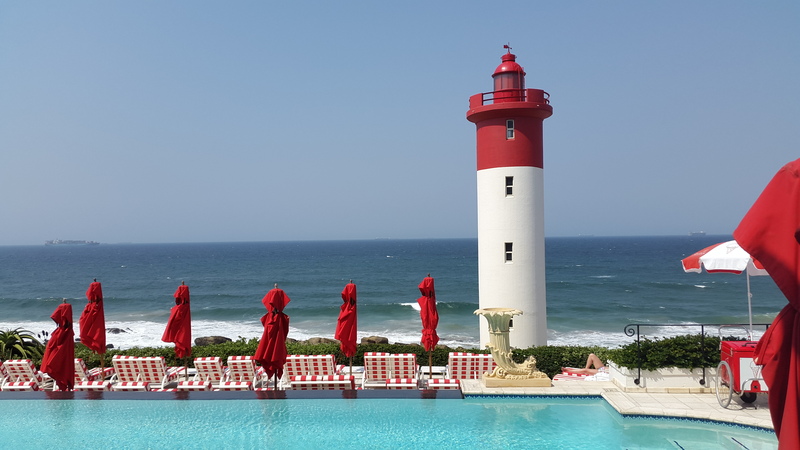 This picture below was snapped from the terrace at the Oyster Box and features the legendary Lighthouse. 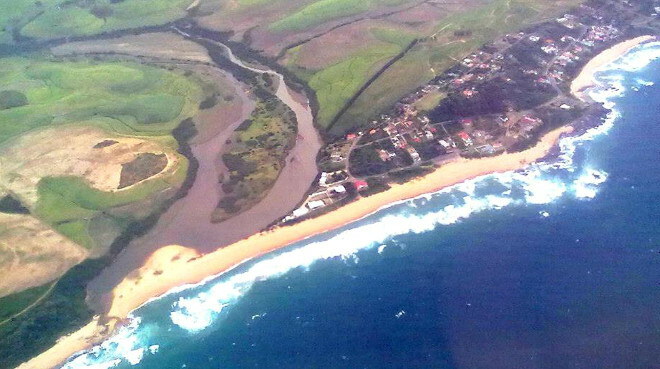 As you come in to land at King Shaka International Airport, enjoy the view of the little resort towns peppered along the coastline - here's a photo of Tinley Manor (on the north coast), with the Mhalali river just south of it. You might even want to get married above the Durban skies. This photo was sent to us by Sarah-Lee Bensingh, whose fiance hired a private charter flight, flew over Durban North and proposed. 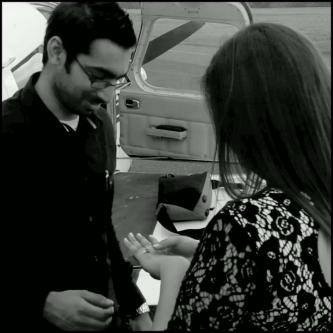 The closest we've seen to this is when, in September 2013, a gent proposed to his fiance on an Emirates flight to Johannesburg. Anybody else proposed on a plane? We'd love to hear your story. After you've landed you'll want to move from the airport. Firstly, there are no trains. Most people opt for car hire. Before you hop into your car make sure that you have cash handy, as you'll hit a toll gate almost immediately. To get from King Shaka Airport to Durban's Beach Road; turn left into Mdloti Street, continue on the M65, keep right at the fork and merge on the N2 National Road, after 12km take the exit to Mount Edgecombe/Phoenix, turn left on thte M41, take the ramp onto the M4, take the exit to Athlone Drive towards Blue Lagoon, turn left onto Athlone Drive and turn right onto Snell Parade Street. It takes about 25 minutes to cover the 30km. Here's where you can sompare car rental price surveys at Durban's King Shaka International Airport. Options at King Shaka Airport include Europcar Durban, First Car Rental, Avis car rental, Budget car rental, Hertz car rental, Tempest car hire, Thrifty Car Rental and Woodford. 17 Aug 2015 : Mango Airlines announced today that they will start operating Lanseria - Durban flights on the 15th of October 2015. This will become a twice return daily service. 6 Mar 2014 : Those on flights to Durban, please be aware of tightened security at King Shaka International Airport as a result of narcotics smuggling at the airport. Congratulations to King Shaka International Airport on coming 2nd in the 2013 ASQ Best Airport in Africa Awards (Cape Town was in first place). Mango Airlines was the most on time airline for flights to Durban in the 2013. 27 January 2014. A British Airways A380 (G-XLED), the fat lady, becomes the largest plane ever to land at King Shaka. The airline is flying a test flight there, as it commences A380 flights from London to Johannesburg in February, and DUR is alternative emergency landing spot. A bunch of planespotters gathered on a hill near the airport to take footage of the super jumbo coming in to land. But before we get to smelling Durban, we have to fly there! There are not quite as many options as for flights to Cape Town or Johannesburg; but all of Mango, Kulula, British Airways, South African Airways, SA Express, Airlink, Air Mauritius and Emirates operate flights to Durban. To book the cheapest flight to Durban's King Shaka International Airport use the airline price comparison tool on the left to compare the airfares of all airlines flying the route and find the cheapest flight (then use any SouthAfrica.TO travel vouchers you have to further discount your flight!). Don't be shy - Request Assistance - if you're stuck, we would be delighted to show you the best flights deal to Durban. Compare prices using the flight price comparison tool on the left. Air Mauritius flights to Durban are from Mauritius only. Airlink flights to Durban are from Bloemfontein only. British Airways Comair flights to Durban are from Cape Town, Johannesburg and Port Elizabeth. Emirates flights to Durban are from Dubai (although it facilitates 1-stop flights from all over the world). Turkish Airlines flies from Istanbul to Durban. Similar to Emirates flights, Turkish Airlines facilites 1-stop flights from all over the world. Kulula flights to Durban are from Cape Town, O.R. Tambo International Airport and Lanseria International Airport. Mango flights to Durban are from Cape Town & Johannesburg O.R. Tambo International Airport (they quit Bloemfontein to Durban flights quite a while back). SA Express flights to Durban are from Cape Town, Port Elizabeth, East London and Harare. South African Airways flights to Durban are from Cape Town only. Emirates operates international flights from Dubai to Durban, SA Express from Harare to Durban & Air Mauritius from Mauritius to Durban. You may also want to consider flights via Johannesburg. There are 2 national roads running through Durban : The N3 from Johannesburg and the N2 from Cape Town. If you don't want to fly, you may be interested in booking a bus ticket to Durban. Options are the Baz bus (hop-on-hop-off at youth hostels), Citiliner (travel to Durban from Bulawayo, Cape Town, Durban, Harare, Johannesburg, Port Elizabeth, Pretoria and Umtata), Greyhound (travel to Durban from the main centres of South Africa, Mozambique and Zimbabwe), Intercape, SA Roadlink (from within South Africa) & Translux (trips to Durban from over 100 destinations in South Africa, Mozambique, Malawi and Zambia). Shosholoza Meyl (economy & tourist class) & Premier Classe offer train trips from Johannesburg to Durban. 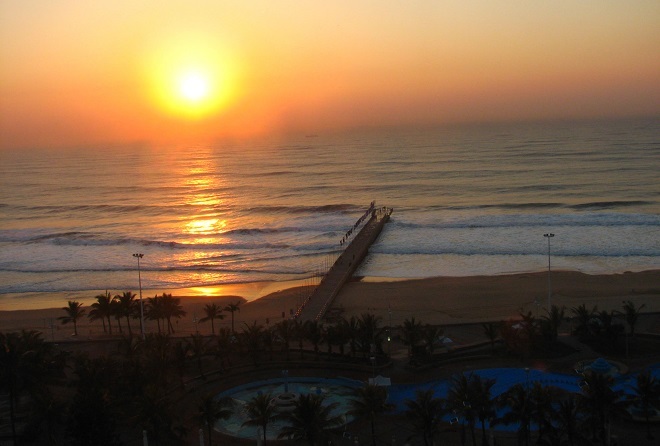 Durban is serviced by King Shaka International Airport, situated north of Durban city (years ago it used to be Durban International Airport to the south of the city). There is no escaping the fact that Durban is an exciting and vibrant city that from the moment you arrive seems to capture your heart. The good all year round temperatures attract folk from all over South Africa who come to soak up the sun on the beachfront. Picking accommodation within easy reach of the ocean is a must and from Umhlanga and La Lucia down to Durban harbour visitors have over 15km of coast to choose from. From luxury boutique guest houses with spas to good value self-catering apartments overlooking the ocean the choice of accommodation is excellent both for the holidaymaker and business traveller. But be warned venues get booked up months in advance especially during the school holidays and in the December peak season so planning in advance is the key to securing the best accommodation. Whether you are staying in North Durban, South Durban or close to the harbour there is a myriad of things to do for the whole family. Choose from lazy days on the beach to fun at Wet & Wild Water Park or swimming with sharks at Ushaka Marine World. End your day with a famous Durban Curry at one of Durban’s many excellent restaurants. 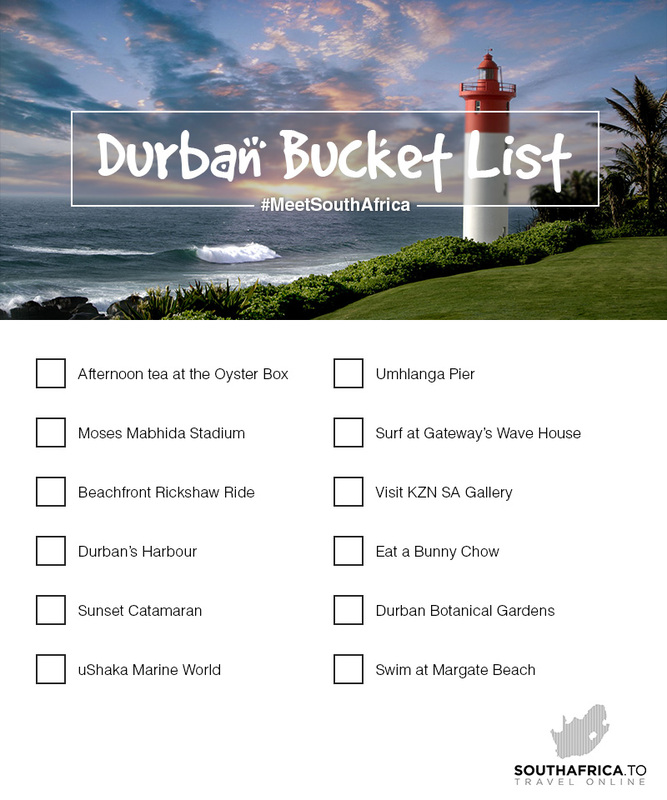 In celebration of SA Tourism Month, we thought we'd compile a tick-box list of things you simply have to do when visiting Durban! Whether you are a first time visitor or lifelong resident, make sure that you print this list and tick things off as you go! Watch the sun rise over the Indian Ocean. Unlike Cape Town where the focus is on the sunset, in Durban it's the sunrises that are spectacular. See our Durban page for a comprehensive list of things to do in Durban. 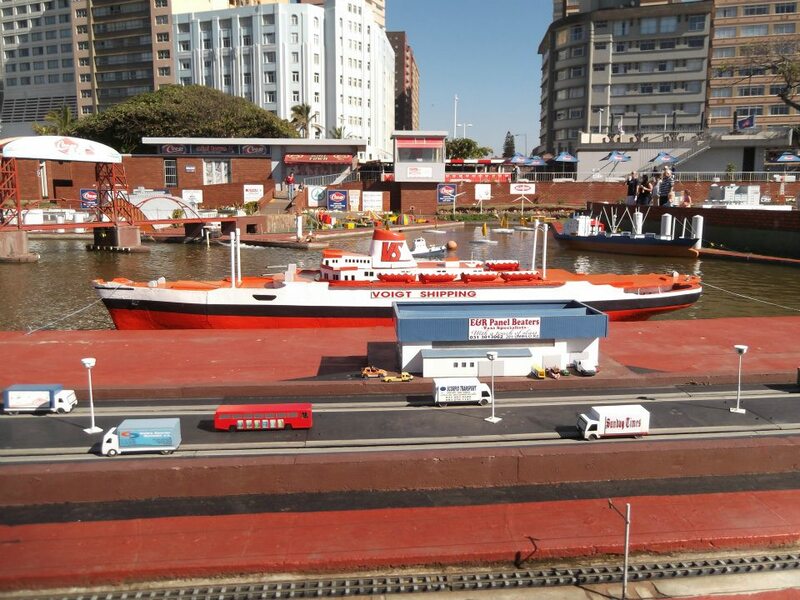 The cruise ship and harbour in this photo are miniature - its from Durban Mini Town - a favourite spot to visit for adults & children alike. Durban is known for its spicy cuisine. "I had a food adventure in Durban. When I think of Durban my nose immediately fills with the fierce spices of a typical Durban curry, my eyes water from the heat of a bunny chow and my mouth yearns for a taste of a hand-made samoosa. One of the best parts of travelling to Durban is the food, especially if you crave something a little – or a lot – hot. Durban markets are some of the best places to get stuck into some local cuisine. Markets are great if you are unsure whether or not you will like Durban food, as they offer up a chance to taste a little bit of everything without paying heaps of money on one dish that you end up not eating. I recommend getting stuck into a curry roti, potato samosa or a kofta (an Indian type of spicy meat ball)!" said Janine in an email to us. 2 Nov 2012 : Three-weekly flights from Harare to Durban are launched by South African Express. 1 May 2010 : King Shaka International Airport becomes operational, and the old Durban International Airport (south of the city) is decomissioned. 1 Oct 2009 : Emirates commences flights from Dubai to Durban. 8 June 1937 : The first flying boat used in a commercial flight from Southampton to Durban, the S-23 Canopus, arrives in Durban. Before we sign off, remember that you can earn travel vouchers by emailing reviews of your flights to Durban to cheapflights@southafrica (can be used to discount flights booked using the flight bookings tool at the top left of this page).